The celebration of the Eucharist, the Liturgy of the Hours, and Eucharistic Adoration in the presence of the Blessed Sacrament exposed throughout the day shape our mission of prayer. This rhythmical pattern of living creates the contemplative context of our lives. Contemplative in character but not cloistered, we seek to strengthen others in their gift of faith and witness to the love of Christ in the Blessed Sacrament by our way of life and the action of the Holy Spirit who called us into community. 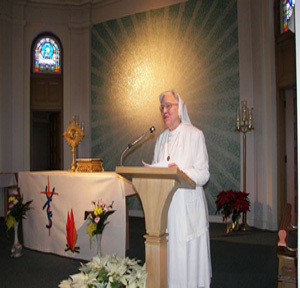 In our everyday living situation the sisters use their diversity of gifts and talents to benefit the community. We unite contemplation and apostolic love in a life of adoration and in activities which are in harmony with this life, inspired by the Eucharist and directed toward this mystery of Faith. "Everything flows from the Holy Eucharist and returns to it: the Congregation's spirit is one and issues from this divine heart, its rules, its works, its means, everything is taken from the adorable Host." (St. Peter Julian Eymard). The Eucharistic grace is not for us alone, but for all those whom the Spirit draws with us to become adorers and apostles of the Eucharist. 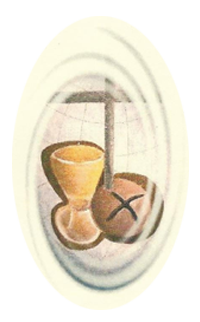 The Eucharistic Association for the laity is one means of transmitting this joy to others. We strive to make each house a eucharistic center, where many people to draw their strength from the Eucharist and share in our life of prayer.